The Stringipoidea is a small superfamily of New Zealand parrots. It only has three genera: Nestor, the Kakapo Strigops and the fossil Nelepsittacus. The genus Nestor consists of the Kea, and the Kaka, while the genus Strigops contains the iconic Kākāpō. All living species are endemic to New Zealand. 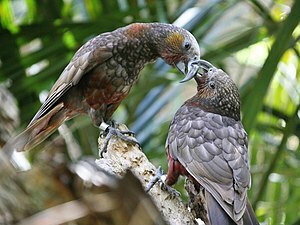 The modern common species names, Kea, Kākā and Kākāpō, are the same as the original Māori names. The nearby island species, the Norfolk Kaka and the Chatham Kaka, became extinct in recent times. The extinct species of the genus Nelepsittacus have been extinct for 16 million years. All living forms are threatened. Human activity caused the two extinctions and the decline of the other three species. Settlers introduced invasive species, such as pigs and possums, which eat the eggs of ground nesting birds. Also hunting for food, killing as agricultural pests, habitat loss, and introduced wasps have added to the problem. The family diverged from the other parrots around 82 million years ago when New Zealand broke off from Gondwana, and the ancestors of the genera Nestor and Strigops diverged from each other between 60 and 80 million years ago. ↑ Bonaparte C.L. 1850. Conspectus Generum Avium, E.J. Brill, Leyden. ↑ Christidis L. & Boles W.E. 2008. Systematics and taxonomy of Australian Birds. Canberra: CSIRO Publishing. p. 200. ISBN 978-0-643-06511-6. ↑ 3.0 3.1 Forshaw, Joseph M.; Cooper, William T. (1981). Parrots of the World (corrected second ed.). David & Charles, Newton Abbot, London. ISBN 0-7153-7698-5. ↑ 4.0 4.1 Millener P.R. 1999. "The history of the Chatham Islands’ bird fauna of the last 7000 years – a chronicle of change and extinction. Proceedings of the 4th International meeting of the Society of Avian Paleontology and Evolution (Washington D.C. 1996).". Smithsonian Contributions to Paleobiology 89: 85–109. http://www.sil.si.edu/smithsoniancontributions/Paleobiology/sc_RecordSingle.cfm?filename=SCtP-0089. ↑ BirdLife International (2008). "Nestor productus". IUCN Red List of Threatened Species. Version 2008. International Union for Conservation of Nature. Retrieved 24 December 2008. CS1 maint: Uses authors parameter (link) Database entry includes a range map and justification for why this species is endangered. ↑ BirdLife International (2008). "Nestor meridionalis". IUCN Red List of Threatened Species. Version 2008. International Union for Conservation of Nature. Retrieved 24 December 2008. CS1 maint: Uses authors parameter (link) Database entry includes a range map and justification for why this species is endangered. ↑ BirdLife International (2008). "Nestor notabilis". IUCN Red List of Threatened Species. Version 2008. International Union for Conservation of Nature. Retrieved 24 December 2008. CS1 maint: Uses authors parameter (link) Database entry includes a range map and justification for why this species is endangered. ↑ Wright T.F. et al 2008. "A multilocus molecular phylogeny of the parrots (Psittaciformes): support for a Gondwanan origin during the Cretaceous". Mol Biol Evol 25 (10): 2141–2156. doi:10.1093/molbev/msn160. PMC 2727385. PMID 18653733. ↑ Grant-Mackie E.J. et al. "Evolution of New Zealand Parrots". NZ Science Teacher 103. This page was last changed on 29 April 2018, at 09:42.